Here is a tag cloud created with Tagxedo showing what I tweeted about in 2011. My Twitter handle is dwicksspu. I shared lots of links using the hashtag #mlearning as I prepared for several presentations on mobile learning. My role as co-chair of the MacLearning.org Steering Committee had me frequently using the tag #maclearning and the handle @maclearning to tweet about how Apple products were being used in teaching and learning . 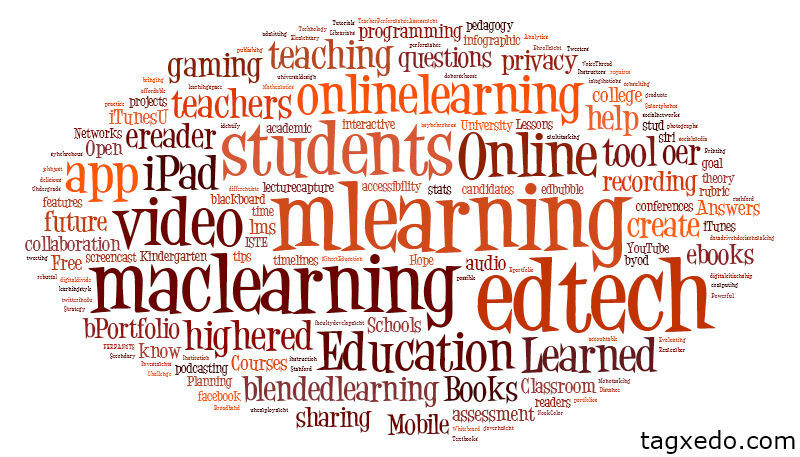 I began a project with five other professors on blended learning in August and used the tag #blendedlearning to share resources that I found. I am predicting that it will be one of my most popular tags in 2012. The hashtag #et5online should also be a popular tag for me in 2012 as I am the program chair for the 5th Annual International Symposium for Emerging Technology in Online Learning. I hope to see you in Las Vegas this summer.